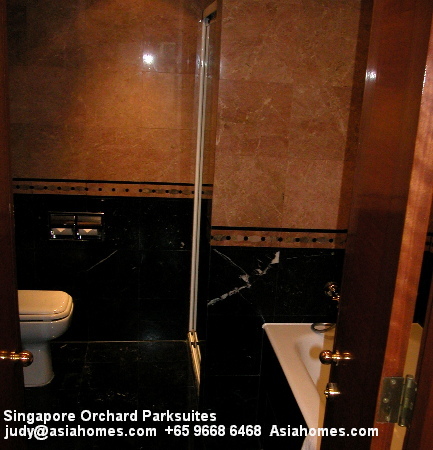 An upscale serviced apartment in prime Orchard Road location. 11 Orchard Turn, one block of 26 storeys, 225 units. Downtown. 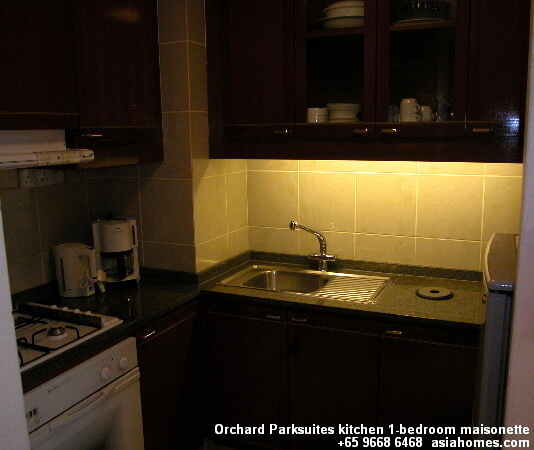 Orchard Parksuites is a choice accommodation of top corporate executives and business leaders. 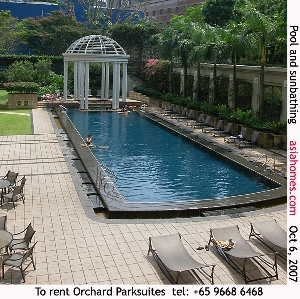 Located in the heart of the Orchard Road shopping and entertainment area, Singapore’s most prestigious district. Orchard Parksuites is a winner of the Garden City Award 2001. It has a beautifully landscaped roof top garden terrace for guests to relax and admire the city views. 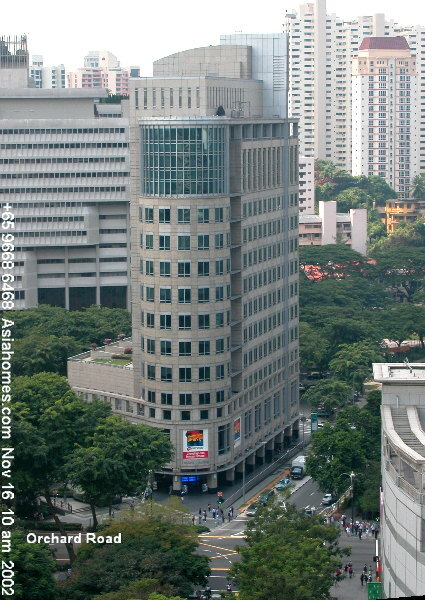 In 2011, Ion Orchard Shopping Mall, next door, adds more vibrance and upscale shopping malls (Prada, Louis Vuitton and others) to tenants of Orchard Parksuites. 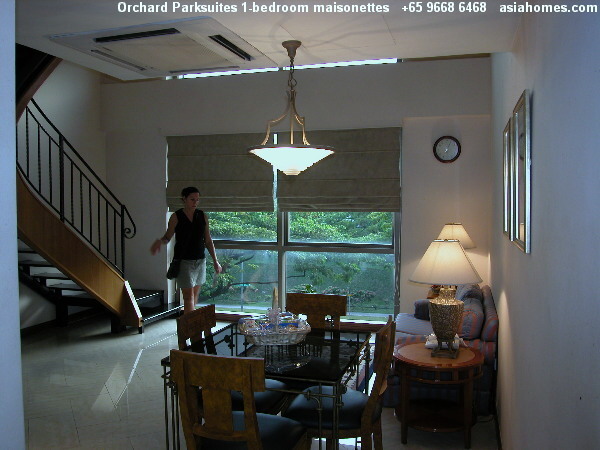 Most of the Singapore serviced apartments are fully occupied now. 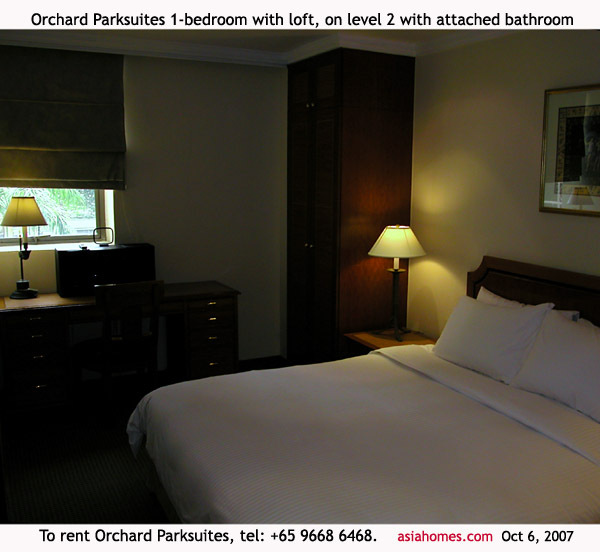 I only have a 3-bedroom unit in Orchard Park Suites from 10 July 2010. 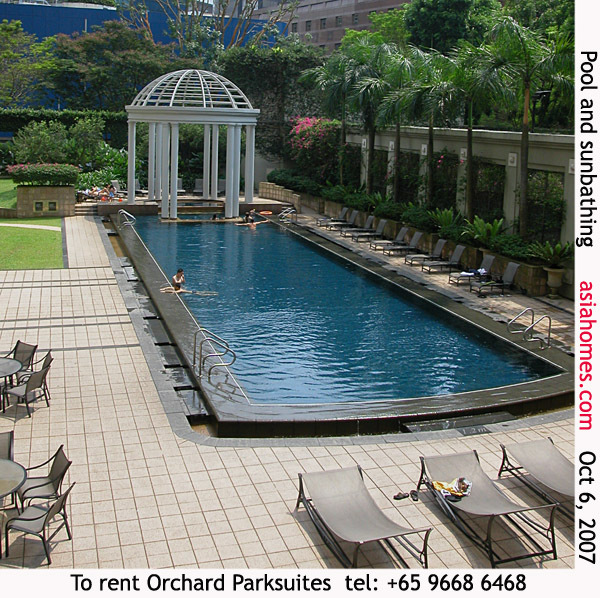 Weekly rate based on 8 days / 7 nights will be S$5,100 and subject to additional 7% Goods & Service Tax. This rate will include daily housekeeping service except Sundays and public holidays, breakfast from Mondays to Fridays except public holidays, internet access, basic tier cable TV, local calls and utility. There will be a King, a Queen and 2 single beds. Common launderette - $4 per use of washer and $4 per use of dryer. Pool Yes. Big swimming pool with underwater music. Jacuzzi and landscaped surroundings. Complimentary Car Parking Yes. Basement parking (one lot per apartment). Others Steam & sauna rooms. BBQ pits & small children's playground. Launderette Yes. Communal washing machine and dryer. Dry cleaning & laundry service upon request. However, such services are available at Takashimaya Shopping Centre. Washing machine & dryer inside unit No. It may be possible to install your own in the bathroom in the bigger bedroom at additional fees. IDD telephone, fax machine. SecretCentury Gothic typing, photocopying & courier services. Check-in at 2 p.m. Reservation held till 6 p.m. Late check-out after 12 noon possible. IDD telephone, fax, air conditioning, TV, cable vision, video-on-demand, hi-fi system with compact disc player. Safe for your valuables, hair dryer, steam iron with ironing board. Hot range cooking equipment, refrigerator, microwave oven, glassware, cutlery & crockery. Attached bathroom in the master bedroom. King-sized bed in master bedroom. 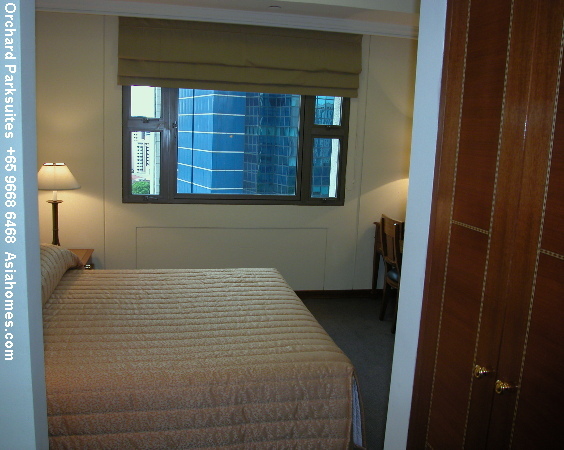 The rent includes daily maid services, Singapore Cable basic tier & continental breakfast from Mondays to Fridays, except public holidays and utilities (water and electricity) for leases of up to 3 months. Broadband internet services for unlimited access based on cable. Cancellation of booking: There is a forfeiture of around 50% of the deposit. No dogs allowed. Non-smoking category: There is no special category. Floor layout plans for units: Standard layout. Loft apartments and maisonettes are 2 levels with the one bedroom (attached bath) on upper level and looking spiral staircase to the living/dining room, with kitchen and bathroom below the bedroom. *Impressive marble floored visitor's lobby. 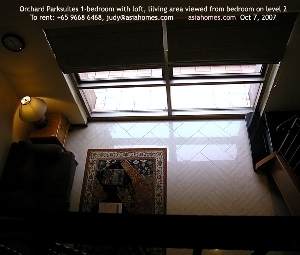 *Great location next to the Orchard subway and shopping malls. *Upscale, 225 luxurious modern classical styled apartments. with food malls and shopping. *5-minute walk to Overseas Family School. *5-minute drive to Embassy Row at Nassim. 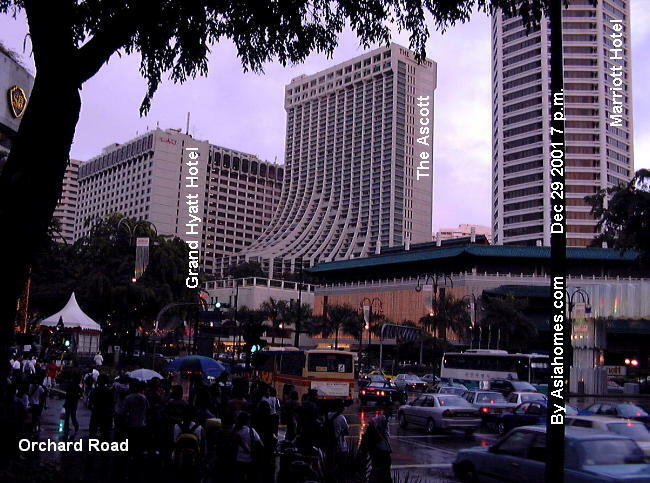 *On Orchard Road, Singapore’s premier shopping & entertainment area. 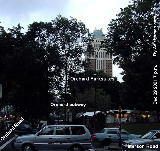 10-minute walk to the American Club. Communal launderette. However, there are laundry and dry-cleaning services at Orchard Parksuites and at the Takashimaya Shopping Centre across the road. 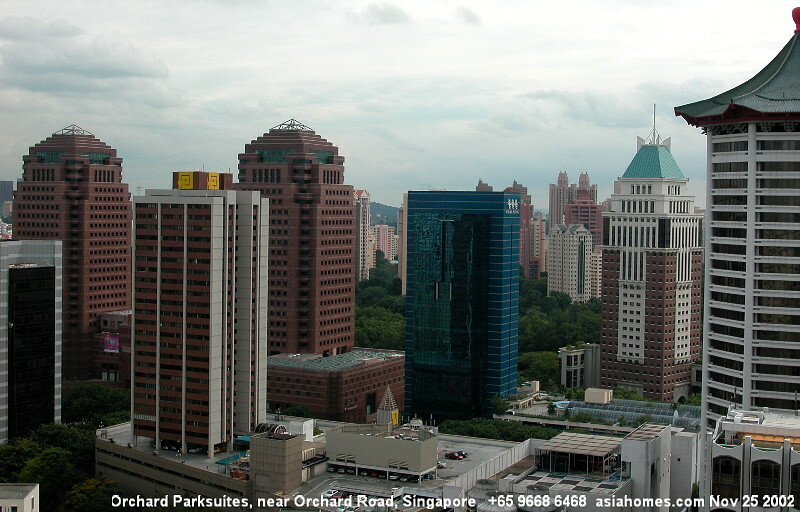 Orchard Parksuites (left), Marriott Hotel and Wisma Shopping Centre. Orchard Parksuites with the blue roof on a rainy December 2002 evening. Orchard Road malls including Wisma Atria & Takashimaya Shopping Centre are less than a 5-minute walk. 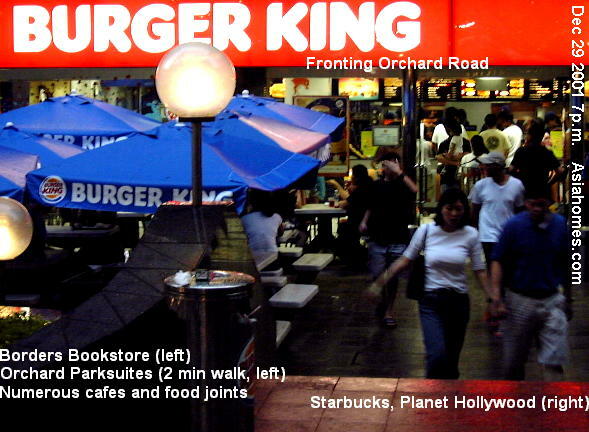 Burger King, Borders Bookstore cafe, Starbucks, Planet Hollywood cafes, the American Club, the Tanglin Club, the National Library, the National Museum, the Fort Canning Park and Botanic Gardens are within a 5-minute drive. *Many buses and taxis. *Food cafes, hawker stalls & eateries everywhere. 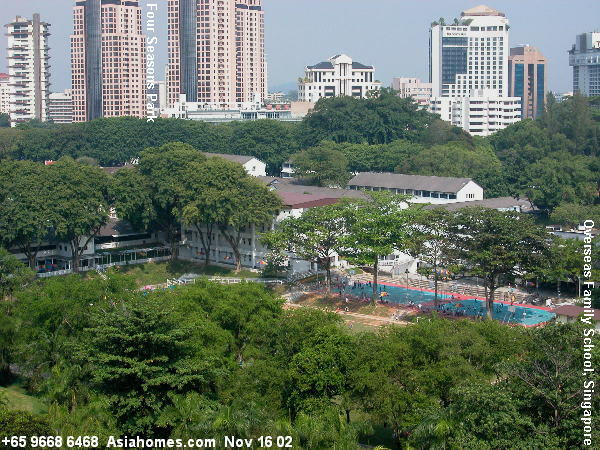 *Supermarkets (Cold Storage including expat's Jason's Supermarket and one at Tanglin Mall for Caucasians. *The cinemas, games arcades and cafes for your kids are located nearby. ONE-BEDROOM WITH LOFT. 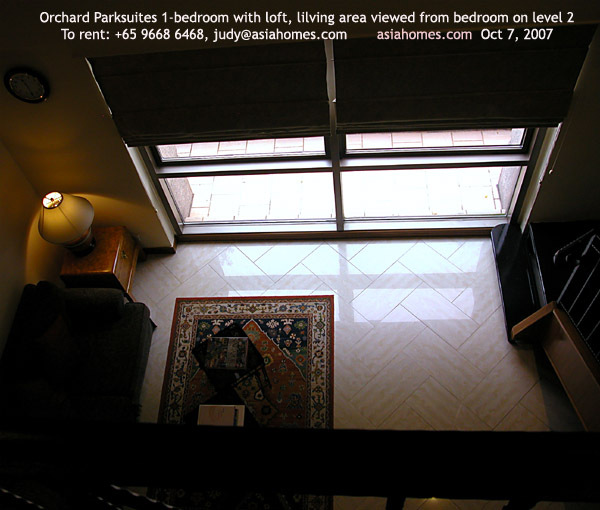 The living and dining area and kitchen is on level 1. The bedroom with a king-sized bed is on level two. Marbled wall and granite counters in the bathroom.